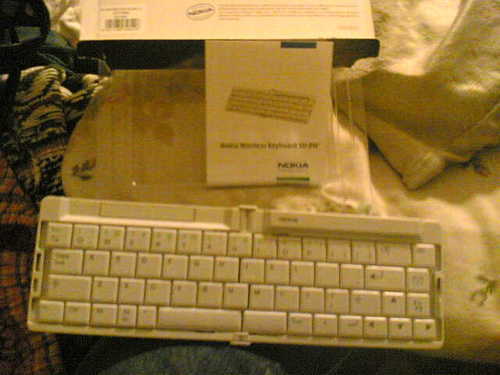 Nokia Wireless Keyboard came today which made my day a bit more exciting. (along with my pink rabbit fur but I'm sure you are not here to hear about that). I was surprised to see how compact it was, although I personally think that it should have come with a carry case. But in any case, it wasn't as big as I thought it would be. differently than regular pairing. 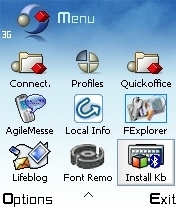 The Keyboard comes with a 32 MB MMC that includes the Wireless Keyboard software application. This application is needed to use the keyboard with the phone. Once installed, you enter the 4-digit code that you would like to use to pair the keyboard. Once you enter the code a message will display on the phone instructing you to enter that same code on the keyboard. Enter your code and then pairing will be complete. 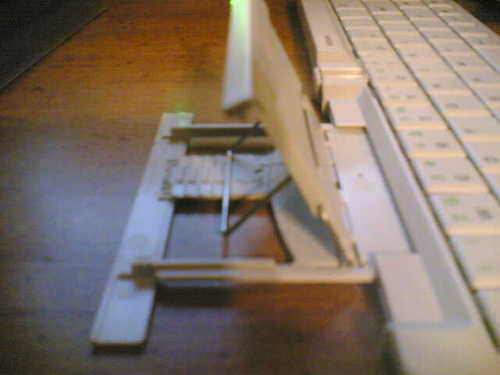 Once the Keyboard application is installed and the pairing is complete you can remove the mmc. Connecting the 2 together afterwards is a breeze. Just turn on the keyboard, activate the BT on the handset then press any key on the keyboard and you are instantly connected. Setting the phone in the display cradle is pretty much simple. Although not reall needed in order to use it does offer a comfortable view of your phones screen. I took a pic of the 6600 in the cradle, but haven't tested compatibility with it. The cradle is adjustable for comfort and is real easy set. Just slide the cradle out, and move the lever to set your phone to which viewing option is right for you. 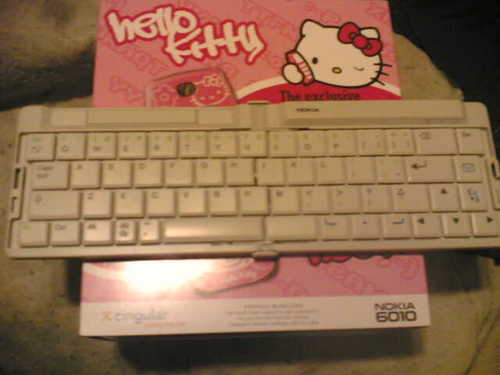 The keyboard is a QWERTY keyboard with additional characters which are in blue and green. One of the cool things about the keypad is that you can open the message menu of the phone by pressing the blue message key on the keyboard. Basically the blue keys help you to manuever around the phones menu. The green keys are a bit tricky. The top row alpha keys also include green numbers which are on the left, and green characters which are on the right. To input the numbers, simply press the green Fn key and type. To input the characters press the green Fn key and press and hold the shift key and type. Simple enough. The small display on the keyboard will let you know if the Fn key is active because th e Fn display will be lit. To select special characters there is a key Alt Gr that you just press and release and the select symbol box will open on your phone. The keypads are easy to use once you get the feel of them. The space bar, however, feels a bit weird possibly because it is so tiny. So far I'm very satisfied with it. Even though we have used mobiles long enough with their wierd keypads (if you can get used to the Nokia 7210 and Nokia 3650 you can use anything!) having a nice functional keyboard is a much better option. Especially if you text message alot. My only quirm about this is not having a carry case... but knowing Nokia I'm sure one will be available in the future! 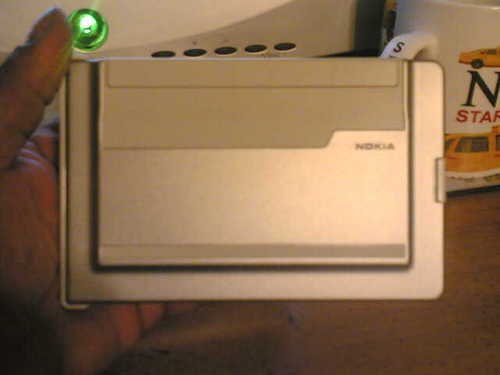 UPDATE: In case you haven't seen the update to this review, I've tested the compatiblity with the Nokia 6600 and it works with no problem. thanks for lots of pics of the keyboard in action - it looks much more stylish than the Cygnet and Stowaway models. Are you sure this works yet with the 6600? Your screenshots seem to show a 6630 screen. Any idea of price as well? 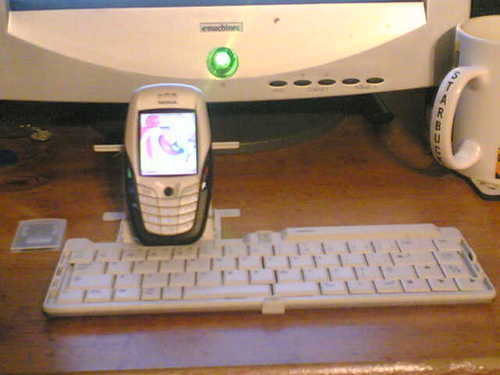 I can't say whether it works with the Nokia 6600 or not. That picture was taken just for display as I was using the 6630 to take the pics. Expansys.com has them for purchase and the price is $150. Thanks for the review. Wondering if typing numbers from the keyboard was just a matter of holding either a shift or Fn key and the corresponding key from the top row...or did you have to hit the keys multiple time like cycling through a phone keypad until you reach the number? In order to input the numbers you must hold the Fn key down until the Fn display is lit, then you can input the numbers. To turn the Fn display off you just hit the Fn key until the display light goes off. The theme that I'm using is the default Nokia theme that came with my 6630. I just changed the fonts on it. Thank you very much for the review Darla! I have been using Nokia wireless keyboard (English layout) for a couple of days now- it is very handy!! I'm wondering if you know how to write accented letters with the keyboard? the accent key on my Nokia keyboard?!?!! I wrote to Nokia but haven't got a reply yet. is it work for quick office excell sheet ? Can anyone recommend a BT keyboard for a 6620? The BT keyboard does work with the 6600 which I've tested myself... (just added the update to this post) I would think that it would work with the 6620 as well. What are you using to read the mmc? Yves, I don't understand how you cannot find the install file. Where did you get the keyboard from? I would definately contact Expansys and let them know the problem. Or contact Nokia and let them know the issue. Yves, its not that simple. There are different files located on the MMC, its not just a sis app. There is also a dat file and who's to say that it won't mess up your phone. Thats why I strongly suggest that you contact Expansys and see if you can do an exchange or have them swap mmcs.